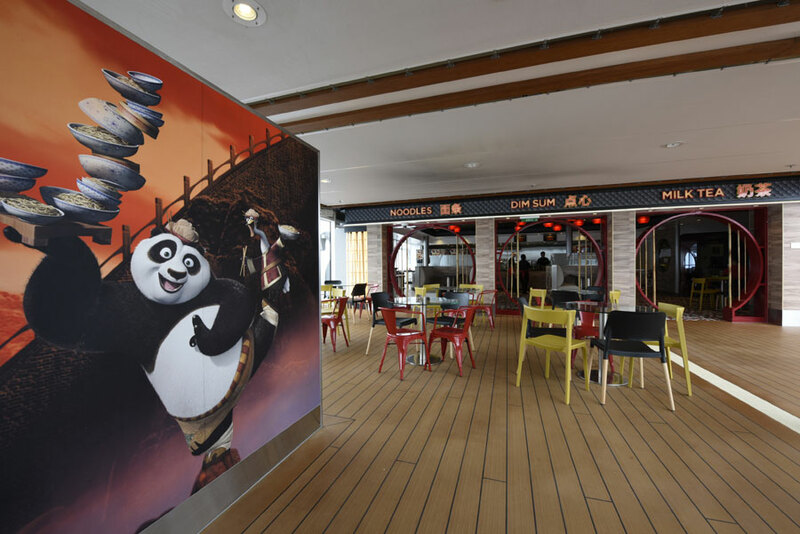 Guests onboard Quantum of the Seas are enjoying Kung Fu Panda Noodle shop which is a brand new addition to the Royal Caribbean operated cruise ship which is now sailing from China. The dining venue is a new family eatery and is the first ever DreamWorks Animation Kung Fu Panda themed restaurant on land or at sea. guests will be able to enjoy popular Asian foods including dim sum and savory noodle bowls. Also featured are traditional desserts which Chinese people go crazy for on the mainland. Some food in the Dreamworks venue will include four-piece dim sum, noodle bowls, such as Taiwanese spicy beef noodles, and desserts including sesame balls and custard tart. Menu a la carte prices start from $2 up to $5. Also guests can get their picture taken with Po and the Furious Five. The DreamWorks experience at sea is only available with Royal Caribbean and can be found on many ships throughout the fleet. Feature-film characters such as Shrek, Fiona and Puss In Boots of Shrek; Alex the Lion and the Penguins of Madagascar; Po of Kung Fu Panda; and Hiccup of How to Train Your Dragon can all be found onboard greeting passengers. There are also plenty activities to keep the young ones busy and a popular parade featuring them all. The DreamWorks Experience is available on Quantum of the Seas, Allure of the Seas, Oasis of the Seas, Freedom of the Seas, Liberty of the Seas, Voyager of the Seas and Mariner of the Seas. Quantum of the Seas is sailing from Shanghai, China all year round on three to eight night itineraries including Japan and Korea. The 168,666 gross ton vessel made its debut in November 2014 and features the innovative North Star, RipCord by iFLY, Seaplex, Bionic Bar and ton more.